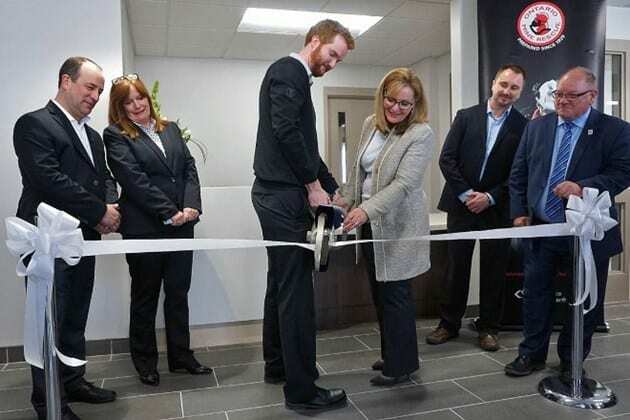 North Bay-headquartered Workplace Safety North (WSN) cut the ribbon on a new Sudbury office, April 18. Located at 235 Cedar Street, the location also provides space for the Ontario Mine Rescue office. WSN is one of four sector-based health and safety associations in Ontario, providing occupational health and safety training and services for mining, forestry and businesses across Northern Ontario. “In addition to being the home of Ontario Mine Rescue headquarters,” said WSN president-CEO Candys Ballanger-Michaud in a press release, “the new location at 235 Cedar Street offers a state-of-the-art learning environment with additional classroom training facilities for Ministry-approved health and safety training, including mining supervisor common core, working at heights, and mine rescue. We plan to move in by the end of May. The office opening coincides with the opening of Workplace Safety North’s annual mining health and safety conference in Sudbury, April 18-20. More than 250 delegates from across the province, and offers free livestreaming of conference sessions to a global audience.